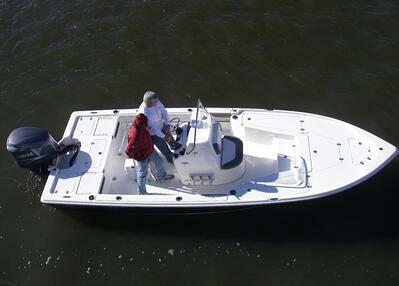 A Center Console boat is simply any boat that has its steering station (console) in the center of the boat (both side to side, and front to back). 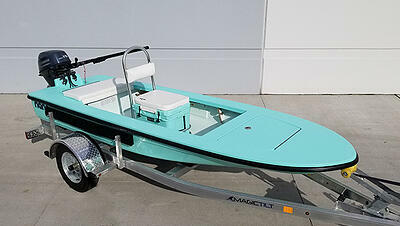 This is different from boats with a side console (most bass boats, pontoons, bowriders, cruisers, etc.). Because of this placement, the wheel and other controls are within easy reach of both port and starboard sides, and docking can be easier because of that. Almost all center consoles have outboard power. Within the family of center console boats are a few different styles that are designed for different bodies of water, conditions, and uses. Here is a brief list of them (fiberglass only) and some of the reasons they may be a good choice for your boating. This is the smallest and simplest center console, and also the rarest in northern boating areas. It is designed specifically for the ultra shallow waters of the glades and swamps where fishing for very sensitive fish species by pushing the boat through the water with a pole while you fish. It is narrow, not very long, has a very flat bottom and not designed for rough water. Often they have very small horsepower engines and sometimes are tiller handle controlled. A good example of this is a NanoCraft Nano 13. This is one step up from the polling skiff, usually is a little longer, and it always has more beam. The flats boat is a more stable craft that allows you to get to your flats area through slightly bigger water. Its main purpose is still fishing in the flats/shallows. It gets the name from the fact that the decks are flush with the casting platform or "flat" and it is often said you fish "on" a flats boat (vs. "in"). A popular model to see this style is the Hewes Redfisher 16. A Bay Boat Center Console has a bit more free-board (hull side height), draws a bit more water, and has a deeper "V" hull (also known as more deadrise). 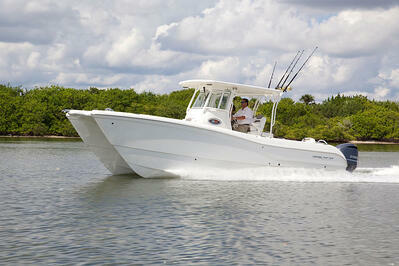 It is typically 15-25' in length, and is the fastest growing segment in the center console market. Getting it's name from the purpose of fishing in the larger "bays" (think Biscayne Bay, Chesapeake Bay, etc. ), it is more of a multi species, and multi purpose boat. Not big enough for true blue water fishing, and yet can certainly handle more than a flats boat. At home on rivers and inland lakes, as well as salt water bays, a bay boat can do a lot of different things with a bit more comfort. A boat to show these characteristics is a KeyWest 210 BR. 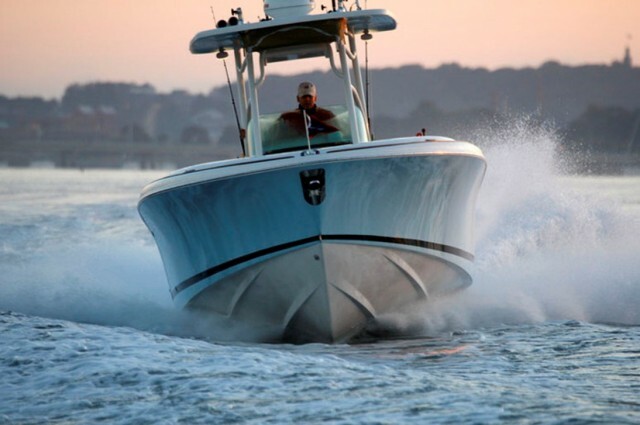 An Offshore or Blue Water center console has much higher hull sides and a much deeper V for handling what the ocean or large lakes throw at it. For going out from shore and fishing larger fish species (both in the ocean and on big lakes), these boast will instill confidence. They are less easy to trailer, and also draw more water (less suitable for shallow water operation). They typically run larger sizes (20-40') and require more horsepower (sometimes multiple engines) to push the higher displacement (weight). Most will have large compartments in the helm for a head or storage, and some will even have cabins. 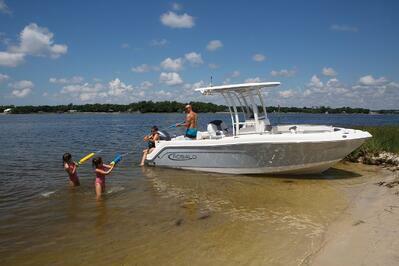 A common example would be the Boston Whaler 250 Outrage. As the name suggests, these boats take something from more than one style and are typically trying to bring larger groups and be more "family friendly". Although they are still fantastic fishing boats, they are larger and often more comfortable with more seating, amenities, wider beam, and with styling that suits a blended use of entertaining, cruising, fishing, water sports, etc. 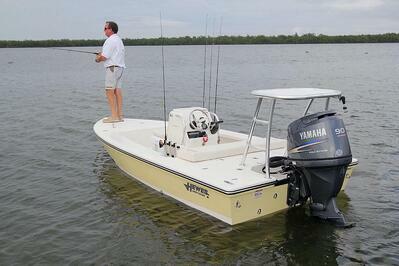 The blend may be between a bay boat and an offshore, or a bay boat and a deck boat hull. They are built between 21 and 26'. 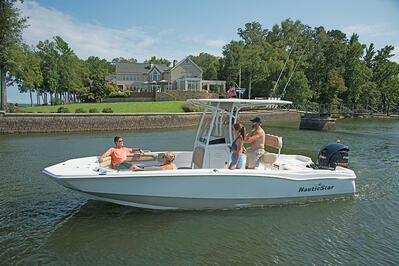 Two boats that fit into this category are the Robalo Explorer 222 and the NauticStar 231 Hybrid. If one head is better than one, are two hulls better than a single? These dual hull ("catamaran") center consoles are meant to tackle the roughest water, give you the most wide and stable platform on the water, and the smoothest and driest wide possible. Think big water and big groups! What makes them great (wide, dual hull), also limits where you can dock and tow them. A catamaran also requires more power, and specialized equipment to lift and trailer it. Check out the World Cat 295CC to see what this style is like. Although we often do many things in our boats, try to apply the "80% rule" when deciding what is best for you. 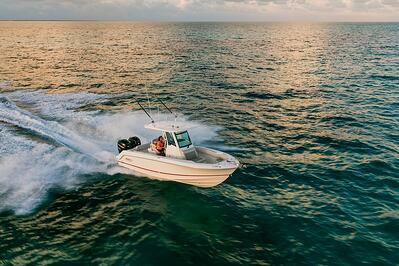 The activity that is closest to 80% of the time you plan to boat, is the right choice. When figuring out what you want, keep in mind three other important "Ws", where, who, and most importantly why. In the fiberglass boat market, outboard power center consoles is the fastest growing segment because of it's fun attitude, safe ride, fishing prowess, versatile performance, and overall cool factor.